It’s the time for cucumber sandwiches and chocolate tarts galore between 14 to 20 August, National Afternoon Tea Week, so time to celebrate and indulge in this traditional social ritual. 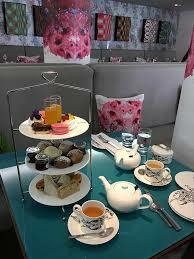 The British custom of Afternoon Tea was invented by Anna, the seventh Duchess of Bedford around the 1840s. With a long wait until dinner, every day around 4pm, she felt ” that sinking feeling” and requested a pot a tea and light snack during the afternoon. She then began inviting a few friends to join her sociable soiree. This innovative idea soon spread, with ladies hosting afternoon tea parties where guests enjoyed a perfectly poured cup of tea, slices of cake and lively gossip and conversation. As popular today as ever, traditional Afternoon Tea continues at many luxury hotels around the UK: In Edinburgh, it is served in elegant style at The Sheraton, The Balmoral and in the Peacock Alley @ Waldorf Astoria, Edinburgh. 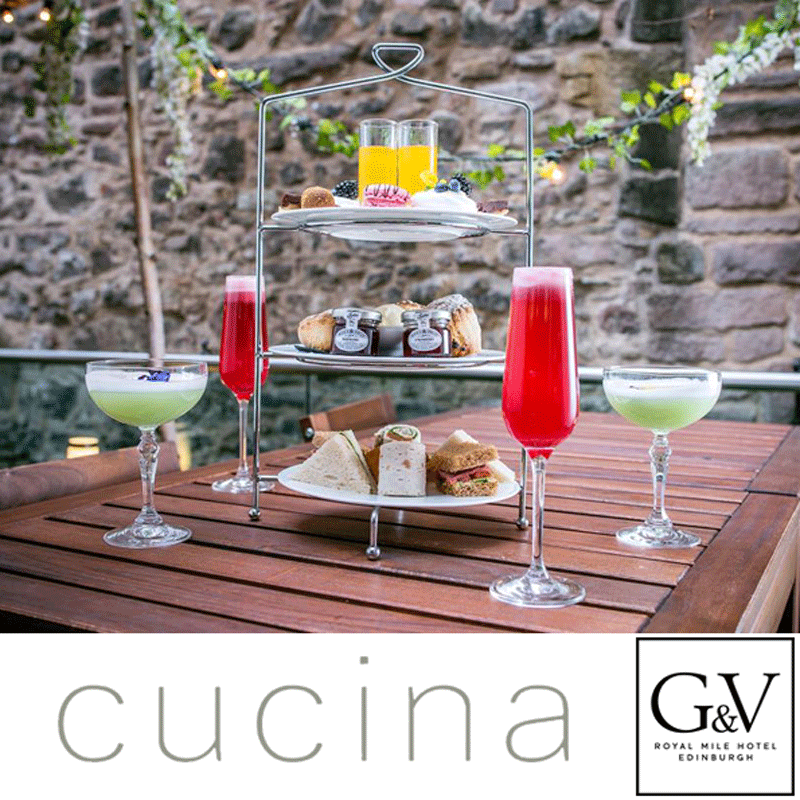 Warmly recommended is the colourfully-designed Cucina at the G&V Hotel, George IV Bridge, to sample a mini feast of tiny savoury sandwiches, scones, clotted cream & jam and patisserie, served with speciality leaf teas. And do indulge yourself with an ice-chilled, beautifully crafted Cocktail or a delicious sparkling Prosecco. What a delightful, leisurely way to spend the afternoon, far from the madding crowd and cultural buzz of the Festivals this August. 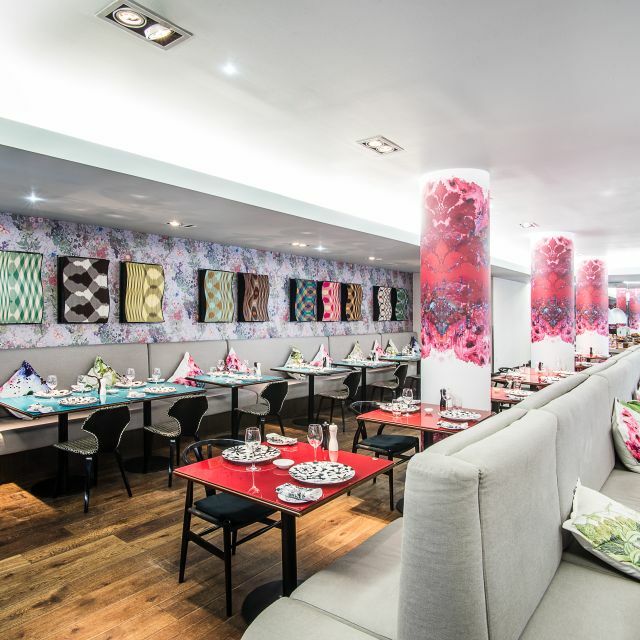 On sunny days, there’s an outdoor terrace outside Cucina, for a special summertime treat. 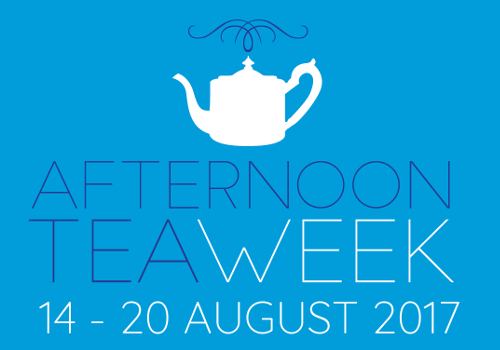 And, of course, you can always book a table here anytime .. . not just through this National Afternoon Tea Week! Calling all art lovers. 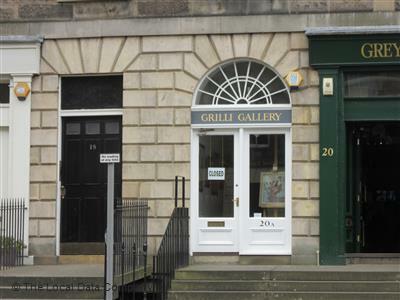 Exciting news for summer 2017 with the re-opening of the former Edinburgh Gallery. After a few years away, Catherine Grilli is back “home” at her new, beautifully decorated Grilli Gallery, Dundas Street. 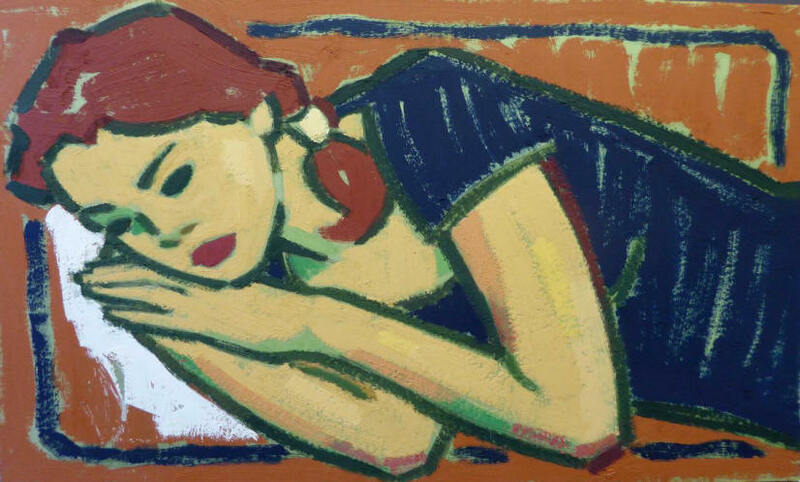 For the first of two exhibitions for the Edinburgh Festival, there’s a marvellous solo showcase of paintings by Joan Gillespie. 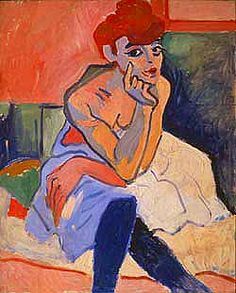 Her artistic training at college started in fine style, being fortunate to study under Alberto Morrocco and also with Sir Robin Philippson. 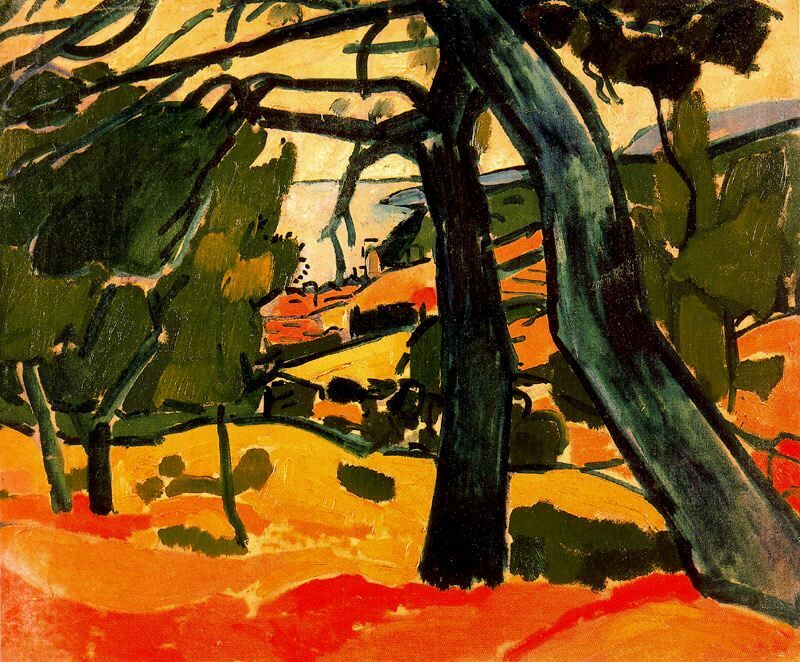 Developing her career, she became inspired by both the Expressionist tradition of The Scottish Colourists and the modern masters of Fauvism – Derain, Matisse and Cezanne. The diversity of Gillespie’s work is quite extraordinary. Walk around this light-filled, L- shaped gallery to see an enchanting collection of Portraits, Figurative works, Landscapes and Still Life. Here are fresh-faced portraits defining the essence of feminine grace and beauty. 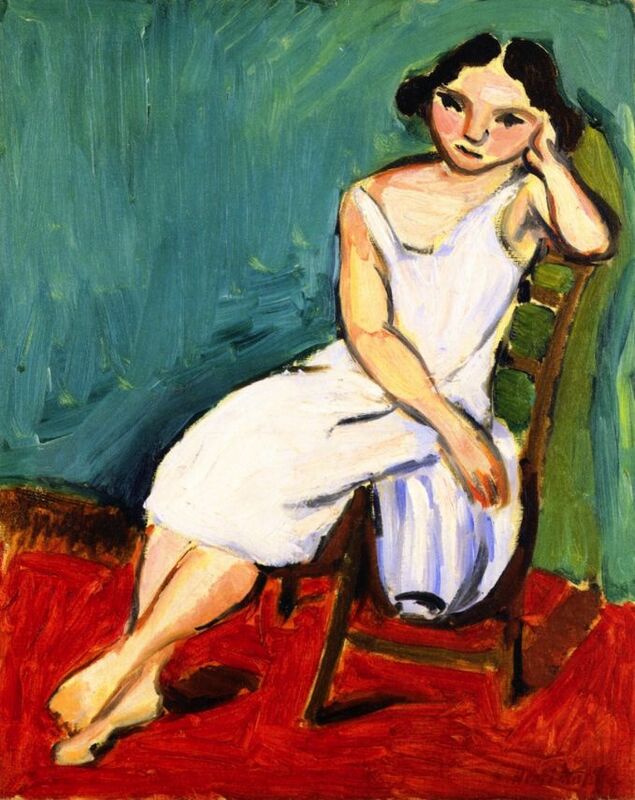 For example, “Window Seat” captures the cool, calm pose of a young woman through the simplicity of quick, broad brushstrokes with just a couple of lines to depict her expressive eyes and thoughtful mood. Akin to a fashion designer drawing a quick sketch, this is enhanced to bring a sense of realism and depth of emotion. 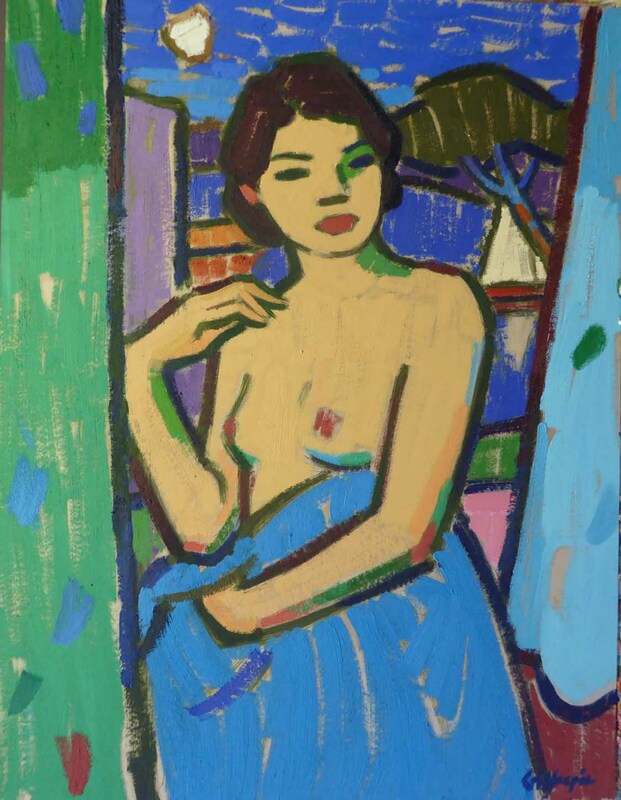 As a homage to Derain and Matisse, this demonstrates her own individual, bold, vibrant approach to colour, both in palette choice and wild, carefree application; spot the splashes of blue and green on her face and dress, to echo the scenic seascape. Despite the vibrancy of tone and texture, this is a most evocative, quiet composition. 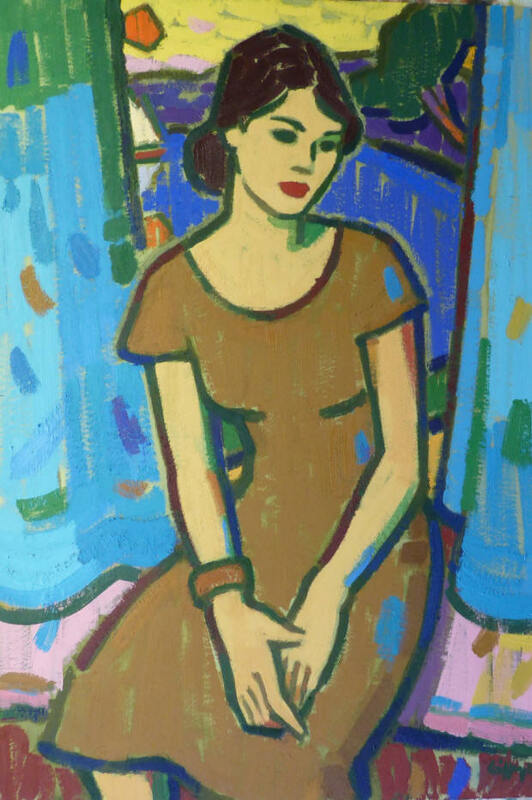 These simple, subtle and serene figurative studies are a visual delight, such as Model in Navy Blue and Night Window and Model in Stripes, each lost in their own thoughts and solitude. 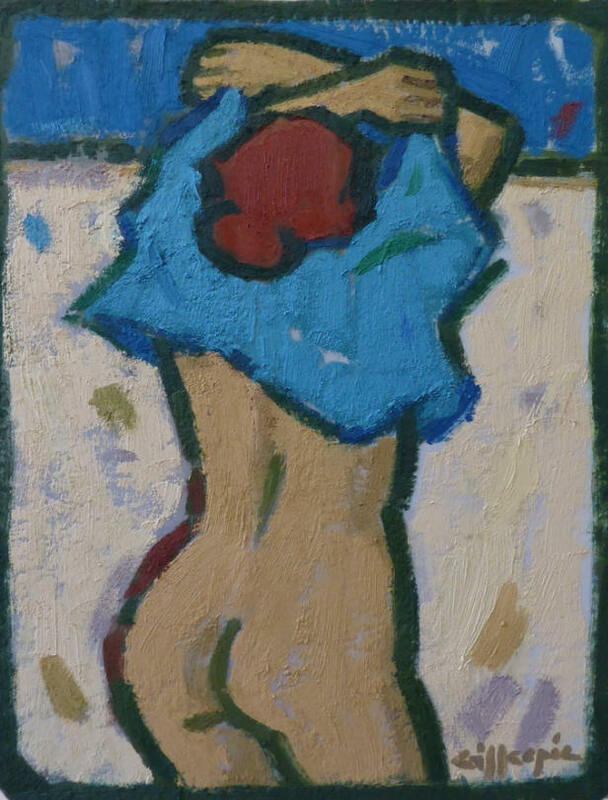 Gillespie develops her own manner and interpretation of the female form with a sensual series of nudes to create delicately intimate scenes which are so expressive in just a brief moment in time – a girl drying herself after a bath, another taking off her blue shirt. Bold, thick lines give clarity to body shape, limbs and flowing hair with a vivid sense of movement and life. A sensual series of nudes create delicately intimate scenes which are so expressive, interpreting a brief moment in time – a girl drying herself after a bath, another taking off her blue shirt. 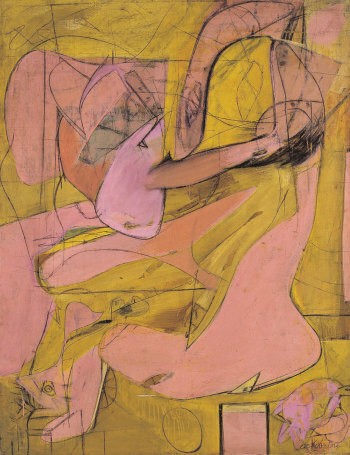 Bold, thick lines give clarity to body shape, limbs and flowing hair with a vivid sense of movement and life. Here too around the gallery walls, breathe in the fragrant scent wafting around from the vases of gorgeous Sunflowers, slender Tulips, vivacious Irises and sweet Roses. 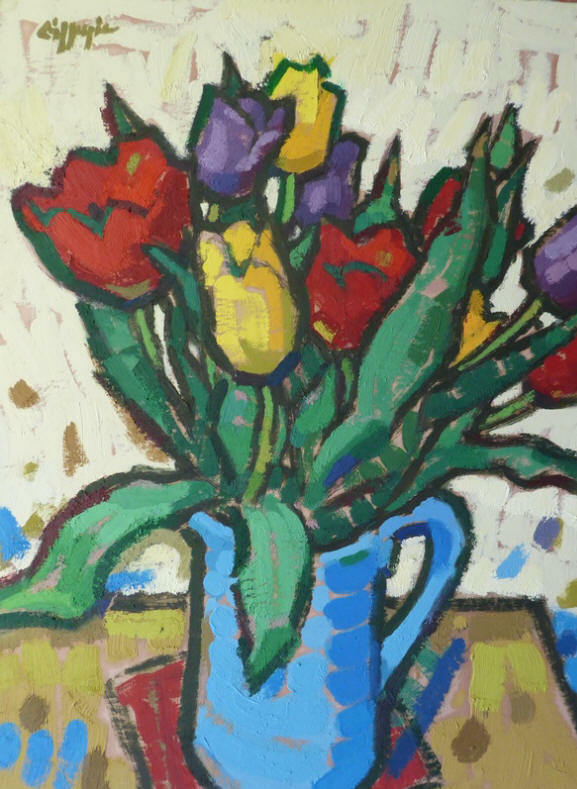 No wonder people love to collect still life paintings such as these joyous images, to bring warmth and the natural world into our homes all year round. 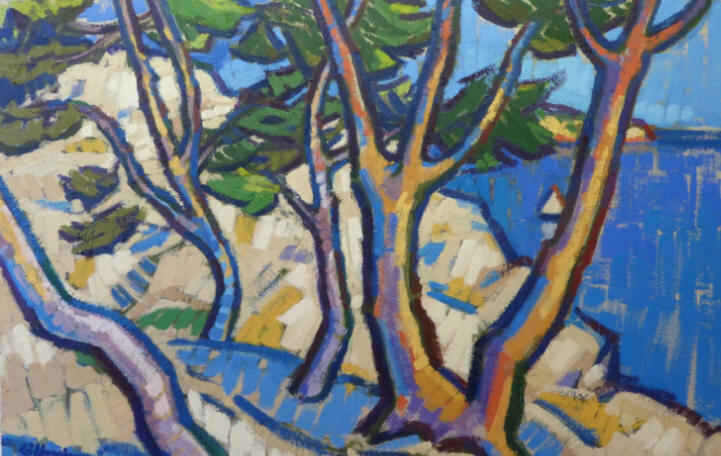 Joan Gillespie, like so many artists across the generations, is drawn to explore the South of France with her paintbrushes and sketchbook, to experience the heat and light along the Cote d’Azur in reality and on canvas. Like a richly illustrated travel brochure, be enticed by her luscious landscapes which layer white sand beaches and the ultramarine blue of the Mediterranean Sea, under the dazzling warmth of the summer sun. After a very successful exhibition last year on the Edinburgh Festival Fringe, Alice Boyle is back this summer with a showcase of scintillating new work at Howe Street Arts, Howe Street, Edinburgh, from 25 July to 13 August, 2017. 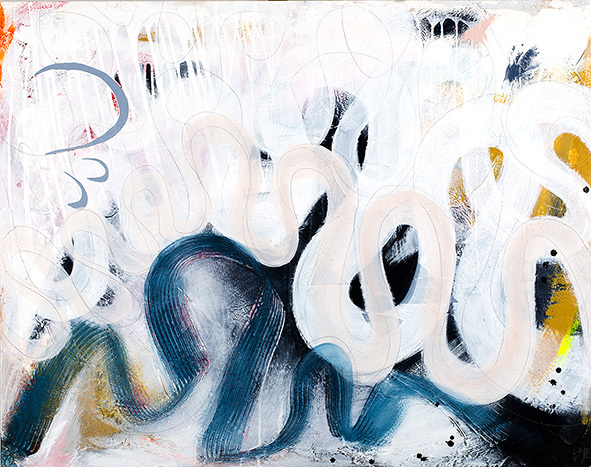 “.. art that set out to paint the way we feel through evocation and sensation. There’s not enough emotion in our art any more. We think too much and feel too little”. 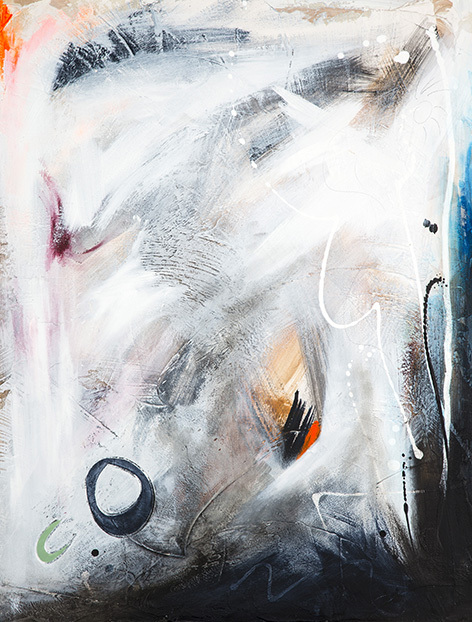 Inspired herself by the Royal Academy retrospective of Rothko, Pollock, Gorky, de Kooning, et al, Alice has taken a new route in the mode and manner of her own abstract expressionistic paintings. Moving away from vibrant colours to a simplified palette, this exciting new collection exudes more of a sense of free-flowing energy and spontaneity, such as “Dancing on Waves” with its powerful force of deep, surging, surfing water. 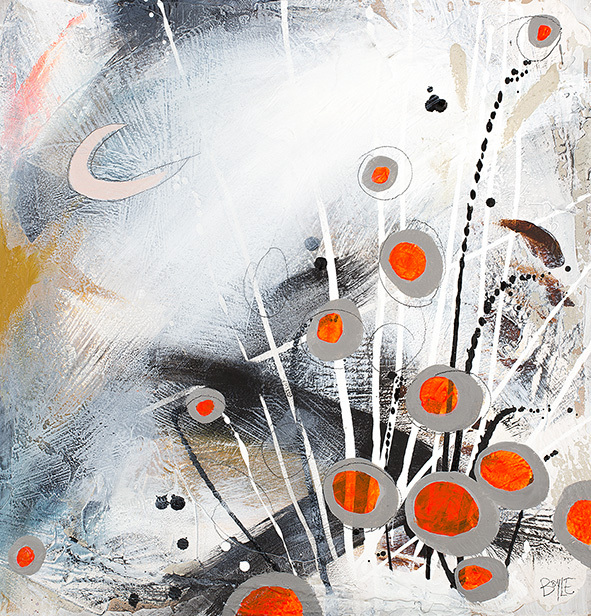 There are also quietly subdued images such as “Are We Nearly Home Yet,” a delicately composed flurry of whiteness, depicting a cool, icy isolated landscape, real or imaginary, with a warming streak of bright orange. 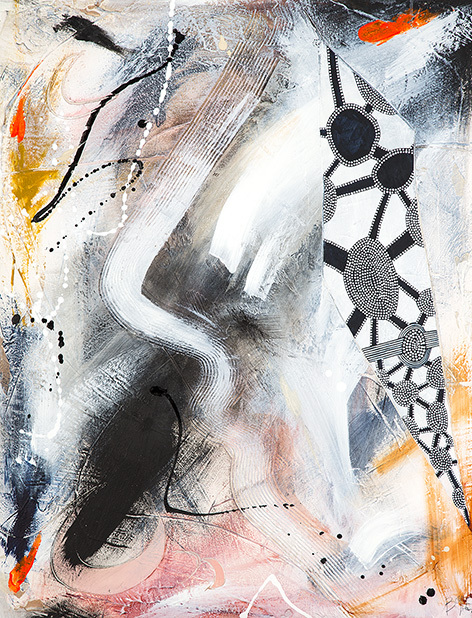 Quirky titles reflect the human spirit and changing complexities of contemporary life, such as “Keep Connecting”, “It will Get Easier”, “Choices.” In similar vein is “Decisions, Decisions”, a mass of swirling circles like a cloud of confusing thoughts, the feeling when one is unable to make up one’s mind. In a more celebratory mood, “Feel the Bright” is a vibrant display of what could be fireworks, with sparkling bursts of light and fire, in which you can almost hear the sound of snap, crackle, pop. “Shine like a Bright Diamond” captures the sharp-edged, multi-faceted features of the gemstone with against an abstract flurry of colour, and dribbles of white paint like a precious pearl necklace. Alice Boyle originally studied Interior Architecture and there are subtle influences here of monochrome, diagrammatic building blocks, blended with the Bridget Riley or Missoni approach to stylistic, structured pattern. Alice uses acrylic paint with plaster to create richly textured layers on hardboard. This is clearly evident in a humorous painting, “Let’s believe in Magic”, where thick brushstrokes create a golden yellow brick road ….perhaps leading us merrily along, off to see the Wizard, the Wonderful Wizard of Oz. 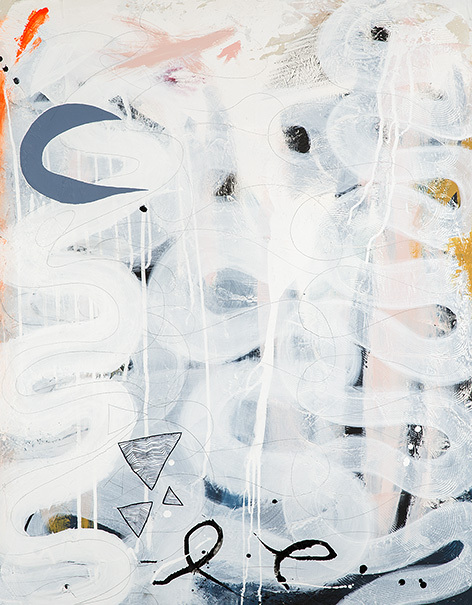 Around the gallery, spot Boyle’s artistic trademark of crescent moons, sparkling stars, swirling circles and oval eggs, which all reflect her own interest in the power of mythology as a way to understand the human condition. birth, life and our place in the universe. “Come Lie with Me” is a whimsical, childlike image of two round button figures, yet with an evocative sexual subtext of romantic love. 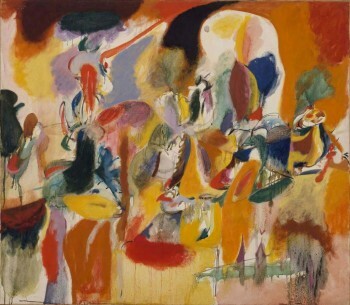 Following this theme, a most distinctive work is the visually imaginative, “Tree of Chaos” akin to a surreal Miro-esque environment, a symbol of growth and the natural world. “Creativity is a wild mind and a disciplined eye” Dorothy Parker. Boyle’s distinctively original work is both wildly creative, yet composed with an astutely detailed, decorative vision: expect to be challenged, emotionally touched and frequently amused. As the title of the exhibition suggests, we should observe this enigmatic work without too much thought and analysis – just go with the flow, simply let the eye follow curving lines and dancing shapes without trying to find hidden depth and an absolute clarity of meaning. 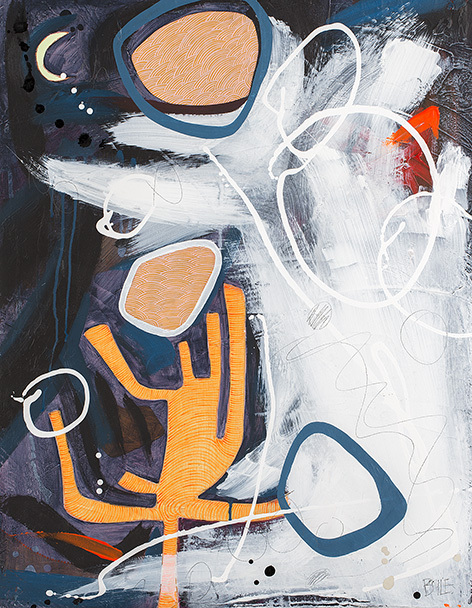 Alice has let her dreams and imagination run riot and fly sky high – the viewer can only excited and exhilarated by these bold and boisterous paintings. 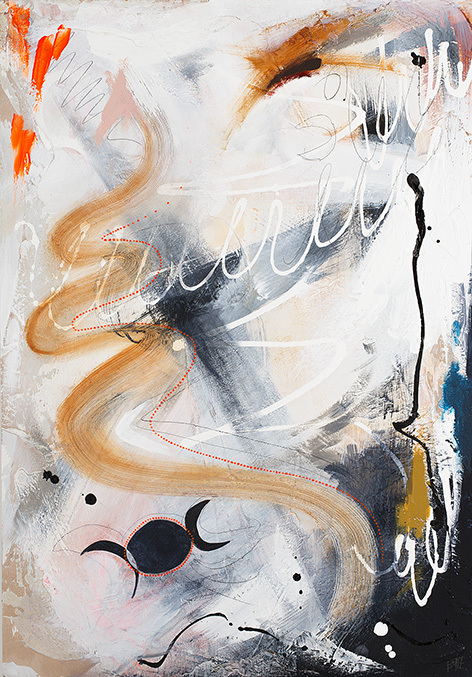 Choreographed like a dance, you will feel a sense of spirited movement, rhythm and energy, representing a passionate love of life, joy and renewed hope – a fresh, new, sassy and sophisticated style of Abstract Expressionism for the 21st century. 25 July to 13 August, 2017 – 10am to 7pm daily.